Yangtze Rep's JUNE IS THE FIRST FALL New York Premiere! The cast includes Alton Alburo, Chun Cho, Stefani Kuo, Fenton Li, and Karsten Otto. In a New York premiere that marks a new chapter for the 27-year-old company rooted in the New York City's vibrant Asian-American community, Yangtze Repertory Theatre tackles JUNE IS THE FIRST FALL, an award-winning contemporary play by Yilong Liu exploring the themes of identity, sexuality, and immigration. Directed by the 2016 OBIE winner Michael Leibenluft, the play tells a story of a gay Chinese man who comes back home to Hawaii and begins a journey of reconciliation between his chosen identity and the heritage he left behind. The production will be playing at New Ohio Theatre (at 154 Christopher Street, NYC); performances run from March 31 thru April 20. Tickets start at $20 and can be purchased through OvationTix (https://web.ovationtix.com/trs/pr/1005801/1551416400000) or by calling 866-811-4111. As part of Page 73’s writers group, Interstate 73, these eight writers meet bi-weekly to share pages, workshop one another’s work, and put on a staged reading of a full-length work towards the end of their year together. Check out an interview I did for Playbill as one of five emerging playwrights to catch in New York this summer! Come see 'delicacy of a puffin heart' July 25th to August 5th! 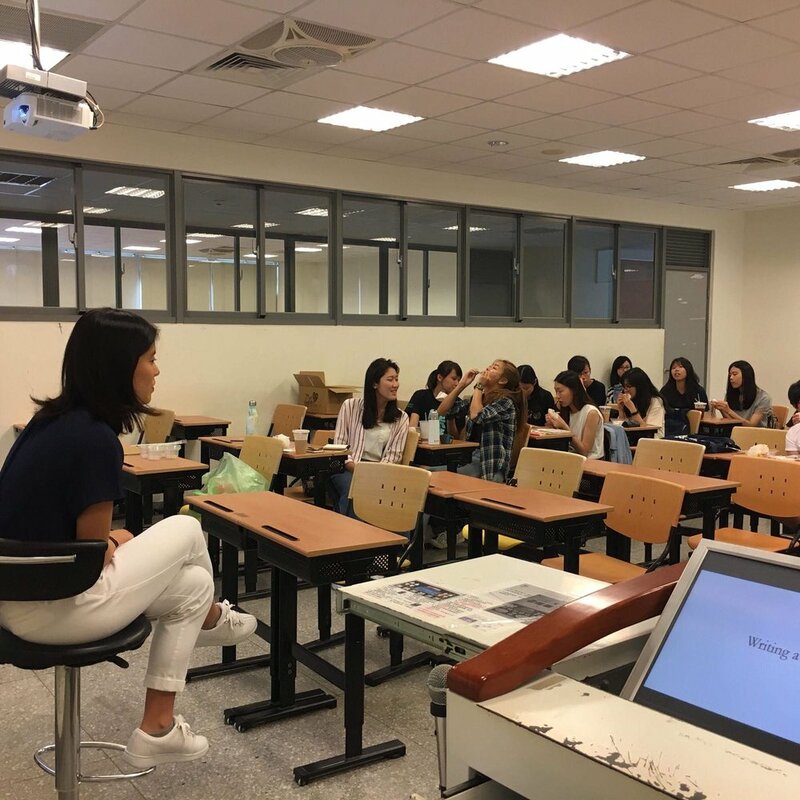 Today, I had the wonderful opportunity of teaching playwriting to a group of seniors in college graduating to become English teachers in the Taipei elementary school system. Thank you Shida for this opportunity, and to these wonderful students who are going to become amazing English teachers for Taipei's children to come! Premiere of 'delicacy of a puffin heart' at Corkscrew Theatre Festival! I am so excited to be announcing that tickets are finally live for my play, delicacy of a puffin heart, that will be going up as part of the 2018 Corkscrew Theatre Festival season! delicacy of a puffin heart will be produced at Paradise Factory, downtown Manhattan, July 25th to August 5th. Come support this new play I am so excited to share with the world! Come see a world premiere of Speaking As Then, a new play by Columbia Playwriting MFA Candidate Ruoxin Xu and directed by Noam Shapiro. Stefani's play, Architecture of Rain, is being produced as a staged reading on Saturday March 10th at 7:30 PM with Checkmark Theatre Company. Checkmark Theatre Company’s mission is to encourage the development of underrepresented artists and their stories. Their inaugural event is a reading series taking place at the Alchemical Theatre Lab (104 West 14th Street, NY, NY, 10011, 3rd floor) on March 9th and 10th. This past August and September I was an artist-in-residence at the Centre of Substructured Loss in Berlin, Germany. The residency was comprised of five female artists from all over the world, and my work, which focused on poetry, photography, and installation art was displayed as part of the exhibition at the end during Berlin Art Week. My work, which focused on my relationship with my father as it relates to our sense of loss, was titled Post-Mortem and is a project I intend to further as a solo performance piece in New York. Stefani Kuo was last seen in The Markers by Maryna Majok, directed by Cristina Angeles, here at the Williamstown Theatre Festival. She most recently worked on the crew for Model American by Jason Kim, and is currently working on a new work, to be produced as a staged reading. In Other Words, originally written for and published in China Hands, has been published in the Chinese edition of the New York Times. The link below is the first half, and the second will be published subsequently! (Originally titled THE SMALLEST BODY OF WATER), TONGUE GRAFTING is a work in progress about the transposing of roots, forgetting and acquisition of language, and the grafting of one body onto another. A performance using music, video, and bodies to question the tangible and intangible things separation, division, and isolation. 30 minutes. As a translator, I worked on translating Sanmao's autobiographical travel memoir, Stories of the Sahara Desert, and wrote a piece on it, titled "In Other Words" for the publication China Hands. Here is the link to the online version of the article, which will be translated in the upcoming months for the Chines New York Times. Enjoy!